The next time you go for a nature walk, try this fun activity (perfect for kids and adults) to discover what hitchhiking plants may have hitched a ride home with you! 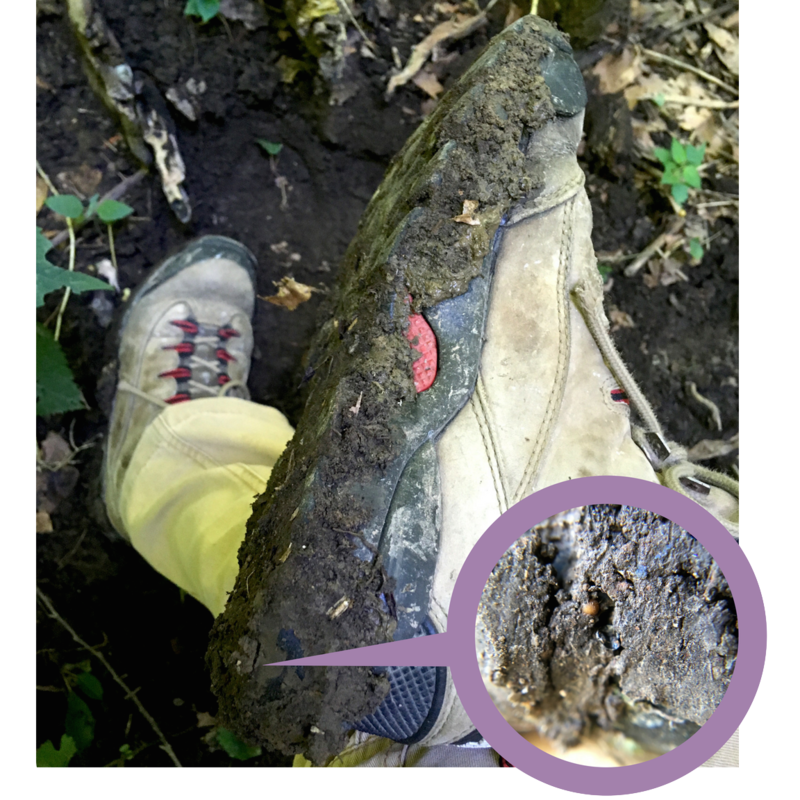 Carefully cleaning off your shoes before and after you visit natural areas is one of the best ways to help prevent the spread of invasive plants within protected woodlands, parks and preserves. Curious to find out just how important the practice can be? The next time you return from a hike, try planting the compacted material you scrape from your treads to see what will grow. Before you start, wash your scraping tool and growing container with hot, soapy water. You can also soak these in a mild bleach solution to further sanitize them. Allow to air-dry. Next, fill your growing container with a sterile potting mix. 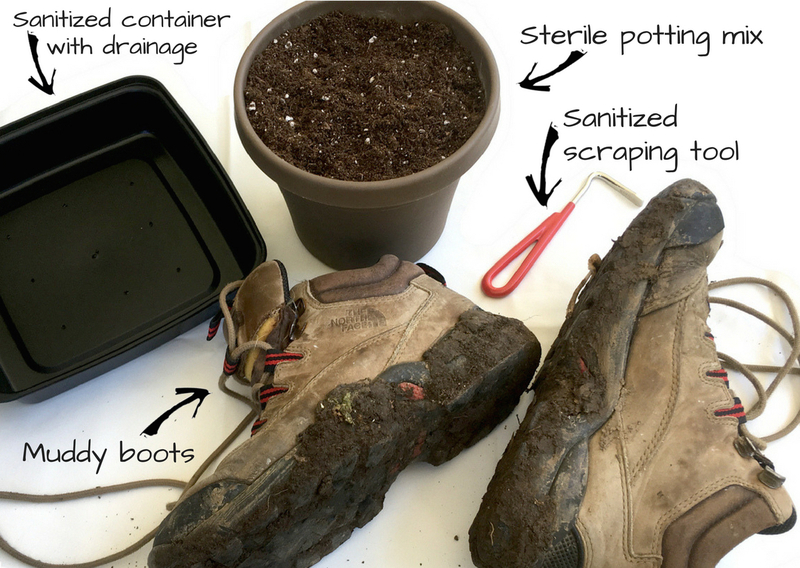 While positioned above your planting container, scrape off the soil and any other organic matter that has collected on the bottom of each of your shoes. Now, water the container and be sure to keep it moist. Just what can you expect? You might see a few invasive weeds or, if you’re lucky, a lovely native plant. But it can take several weeks before you notice any germination, and several factors influence what will—or won’t—come up. For instance, some seeds require darkness to germinate, while others need light. Some — particularly those with tough exteriors like kudzu, morning glory, and crown vetch — need to be roughed up a bit first. And if you picked up tiny spores from ferns along the forest floor? It could take many months before those would rear their fiddleheads. Still, other plants may pop up right away. 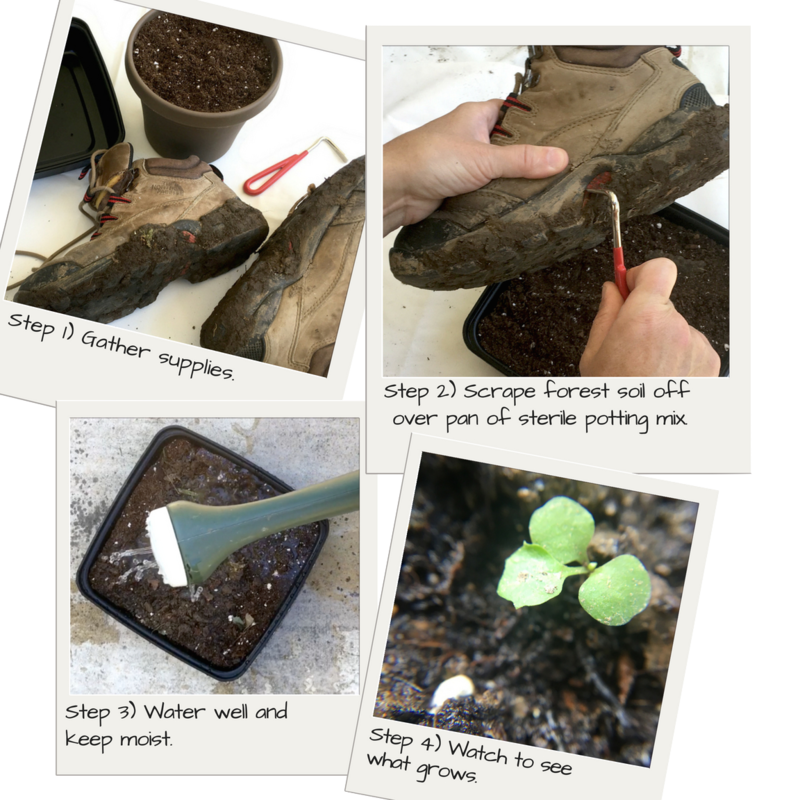 This can happen if you step on a seed that already had begun to germinate or if you transfer part of a plant that easily spreads via stems, leaves, or rhizomes. But what if nothing seems to be growing in your container? That doesn’t necessarily mean you got through the woods without picking up some hitchhikers. Many seeds can remain viable for several years and simply won’t germinate until conditions are perfect. Your local climate and season also will affect what grows. Seeds collected from areas which have hard freezes and cold winters often must go through a period of cold dormancy before they will germinate. As such, newly produced seeds collected in late summer might not sprout until they’ve experienced a period of “winter.” You can simulate this by sealing your planted container inside a thick, airtight bag and placing it in your freezer for several weeks. After this induced winter, place the container in a warm location, keep the soil moist and then see what springs up.